God can work in mighty ways when we will but trust Him to do so. 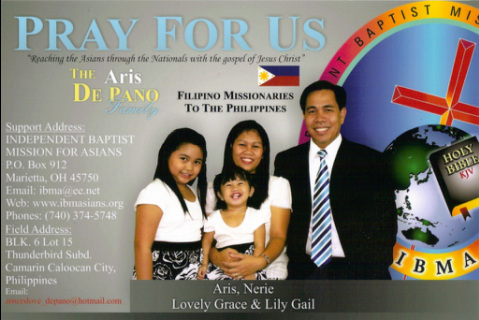 That is the message that missionary Aris De Pano shared on Wednesday, May 25th and the tenet his family lives by daily. The De Panos are Filipino missionaries living in Caloocan City, a dangerous portion of the Philippines capital Manila. The De Panos came to America seeking help in the latest work God has lead them to. The church the De Panos started has grown beyond the capacity of the building they rent and so they cannot reach out to hundreds of children in the area or accomodate the increasing number of attendees each Sunday. Mr. De Pano recently purchased some land to build a new church building on, doing so totally in faith that God would provide the money necessary. Though the church had less than half the amount needed to purchase the plot, he knew God was leading him to build the new church there. Stepping out in faith he contacted the seller and discovered it was also being looked at by a group of musilms who wished to build a school on that site. Initially the seller was reluctant to reduce the asking price to what Mr. De Pano offered, but after much prayer, the seller dropped the price and started drawing up the paper work needed for the transferral of the property. After some months and much prayer, the Lord provided the money needed to buy the land. God supplied a Christian construction company owner who offered his equipment free to the church to allow it to be built. And as though God's working need further evidence, during construction regular Bible Studies for the workers were held. Amongst those attending was a musilim man, who through that Bible study has come to accept Jesus Christ as his Lord and Savior! Already the fruit of this work is evident and it continues to grow in its impact for the Kingdom of God. Keep the DePanos and the believers in Caloocan City. Many of you will remember that early in November a Super Typhoon named Haiyan hit the Philippines and devastated much of the country. It has been some time since then and Pastor Stan recently spoke with Pastor Aris DePano and got an update on his family and congregation. The typhoon hit near where they live, but the Lord was watching over them as ever and there was only very minimal damage to their home and the church building. All of the DePanos are fine, but there is a great need amongst many a short distance from where the DePanos live. Pray that the Lord will give the DePanos the wisdom and opportunities and compassion needed to minister to those in desperate need. Please keep them in your prayers daily as they move forward in their work for the Lord as well. You may continue to give, as you are able, to support the DePanos' work among the people of the Philippines. You can do so at The Crossing by placing it in a marked envelope during the offering (all of which will then go to the DePanos for use in reaching Calacoon City in the Philippines) or for more information you can go to www.ibmasians.org or e-mail the De Panos at: arnerslove_depano@hotmail.com .